By now, with the exception of the flowering ornamental onions, all the spring blooms are done. We've gotten a lot of rain the past couple of weeks, a couple of frost scares, and some cold weather, so I have not been out in my garden as I should have been. And it shows…it is very, very weedy. Because of the rain, everything has grown several feet in a week, and is very lush and green, but so have the weeds. Now I am on vacation for nine days, so I won't be able to garden at all. I can only imagine the mess I will come back to when I return. Oh well, I will try not to dwell on it and enjoy myself on vacation. The weeds can wait. Wild Columbine and Catmint. I love Wild Columbine. It grows in dry shade. It reseeds nicely, but is not invasive. It has pretty foliage when not in bloom. And I love the way the little pink and yellow flowers seem to dance in the air. Such a graceful flower. My Ferns and Hosta are loving this wet weather. They have filled the hillside with their tall, graceful, plumes. Here are the ferns from the top of the hillside looking down. They are about three feet tall. Aren't they gorgeous? This is one of my favorite trees in our yard. It has beautiful yellow leaves in the spring, it is very tall and strong, and it has interesting fall foliage as well. The size of this Blue Hosta is amazing! I need to dig another Hosta up that is growing right next to it because it is being swallowed up by this beauty. 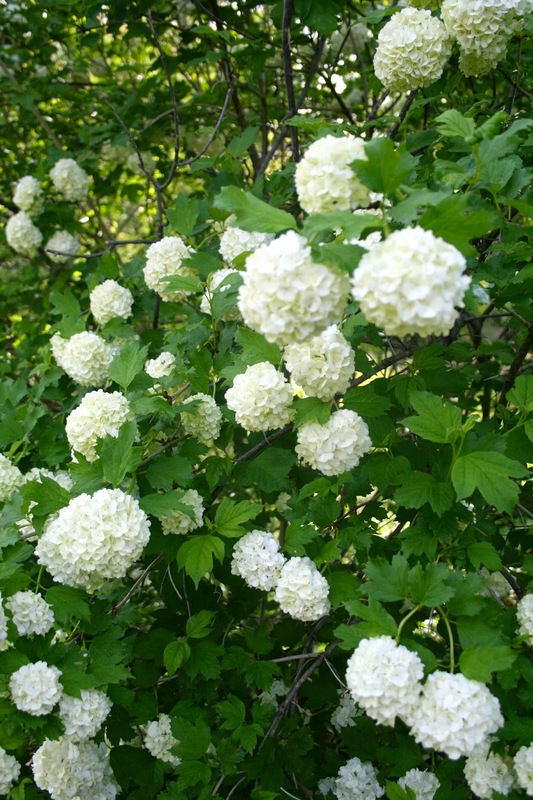 I have two Snowball Bushes in my yard (sorry, I really don't know the real, scientific name. 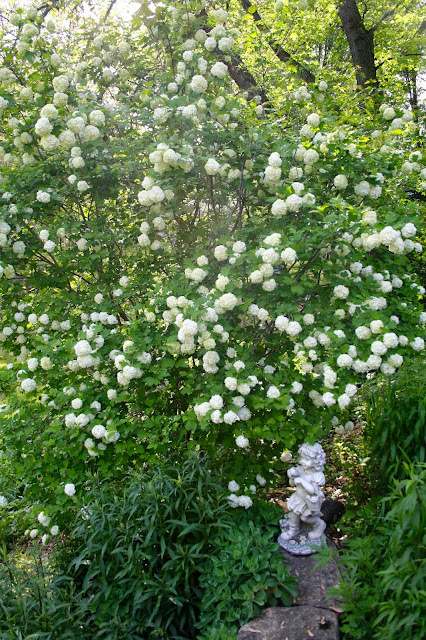 It's blooms look like snowballs, so I call it a Snowball Bush! If I had to guess, I'd say it's some type of Viburnum). One Snowball Bush is growing on my hillside, and another is growing right next to my shed. Look at these gorgeous blooms! LOVE! This is my Flowering Ornamental Onion. The last of the spring bulbs to bloom. If you have trouble growing plants from bulbs because of animals digging them up, then this is the bulb for you. Animals will never dig this plant up because it is in the onion family. In fact, they even say to plant this bulb next to bulbs animals do like to eat, and it will deter them away! This is a view of my ferns looking up the hill from the bottom of my garden. So lush! It looks like my Iris, one of my favorite flowers (but, like I said in last week's garden post, they are all my favorite flowers. I love whatever happens to be in bloom at the moment) will be blooming while I am on vacation. So I will miss that show this year. Darn. You know what I'll also miss? Warm weather! Apparently it will be cold and rainy (50s & 60s) the entire week I'm in Colorado and it will be warm here (70s & 80s). I tell you, I jinx everywhere I go when I'm on vacation. No matter what time of year it is….there is always a 'record cold spell' when I arrive! Unbelievable. Oh well, I packed warm clothes and rain gear, and I'm gonna have fun regardless! Your garden is gorgeous! I am the worst gardener ever so I am very impressed with your skills! Amy, I am so jealous of all your beautiful foliage! It's all so Gorgeous! Slowly trying to work on my landscape and am happy it is coming together. Even happier to live in a home surrounded by mature trees and a beautiful creek. Always surprised at the wildlife that pops up in my yard now. Enjoy your vacation! Oh so lovely images ! your garden is a beauty !